Episode three of Batman: The Enemy Within delivers a compellingly sympathetic portrait of a character that we’ve been trained to immediately hate on sight. In Telltale Games’ re-imagined Batman universe, Bruce Wayne and John Doe—the man who will become the Joker—are bros. Harley Quinn flirts with the former, while allowing the latter to float around her in an orbit of infatuation. But things are churning in John Doe’s green-haired skull, things that will almost certainly surprise the psychiatrist-turned-lawbreaker. Last month’s chapter of The Enemy Within introduced a radically different version of Harley Quinn, already a full-blown criminal mastermind. On an undercover assignment from Amanda Waller, Bruce Wayne leans on his father’s sordid past and poses as a criminal to try and stop the villainous cabal called the Pact. He gets to know both Harley and the Joker during his mission and players get to see what makes them tick. 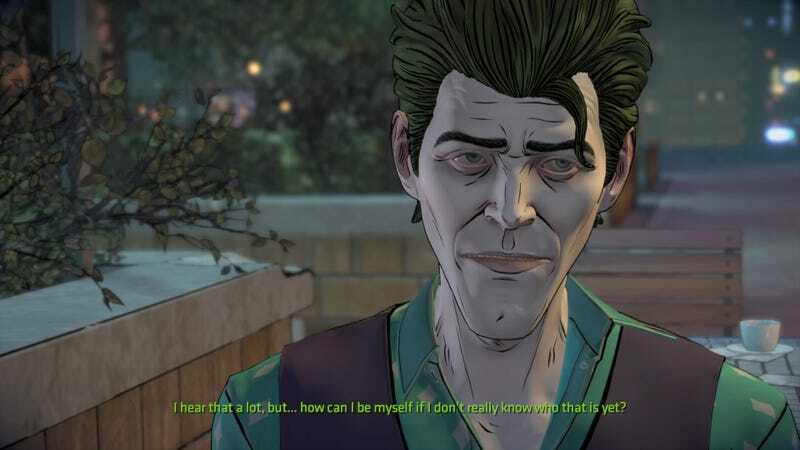 One of the arcs in the second season of this episodic Bat-game is how players’ choices as Bruce/Batman will influence that transformation into the Joker. Unless Batman: The Enemy Within really winds up exploding canonical expectations, then it’s a given that this season will end up with Batman fighting John-Doe-turned-Joker. Part of John Doe’s appeal here is that he’s not really that bad yet, not when compared to the other Joker iterations scattered throughout comics, TV shows, and movies. John and Bruce have a heart-to-heart at a cafe, including some roleplay where Bruce acts like Harley to help John figure out how to win her over. One exchange between the two men has John Doe poignantly remembering Arkham and talking about how discomfited he is outside its walls. It’s an impressive bit of scripting that doubles down on the idea that John Doe is an embryonic figure. He’s a clown, yes, but not yet a prince of crime. He gets excited by arguments, violence, and breaking social niceties but isn’t always brash enough to pro-actively do those things. In making John Doe a lovesick wannabe, Telltale’s creators have made a disarmingly sympathetic proto-Joker. He’s yearning for romantic connection, existential purpose, and peer respect, goals that are easy touchstones for most people. The existential beats get driven home as John talks multiple times about not knowing who he is yet. It’s all very on the nose but the plot thread gets added energy from being driven by player input. Each interaction with John Doe is fraught with awful tension, pulsing with the idea that this particular Joker might be even more vicious because, say, you didn’t give him a handshake. This proto-Joker is particularly fascinating because he’s pining for a Harley Quinn who became an alpha criminal because she’s a master manipulator. This Harley juggles a mix of menacing banter and sudden violence to keep both allies and enemies off balance. But she sees John Doe as a useful plaything and that image keeps his volatile depths hidden to her. The major personas in The Enemy Within who’ve encountered John Doe either think he’s creepy, unpredictable, or harmless. Nobody thinks he’s going to be an apex nemesis the way that Riddler, Bane, or Oswald Cobblepot have been. Fittingly, it’s only Bruce who has a sense of what’s roiling inside the pale-skinned criminal. The downside of watching this fascinating Joker incubation is the awareness that Harley probably won’t be on center stage for the climax of this season’s arc. This Harley is too layered a character to be unceremoniously nudged off the side and I’m really hoping that, in this divergent, anything-goes Bat-mythos, she doesn’t get killed in order for John Doe to complete his transformation into the Joker. It’d be far more interesting to have these remixed versions of the Joker and Harley Quinn co-exist in the Telltale Batman universe, and letting their tangled histories with Bruce Wayne give rise to a fresh take to familiar characters. • I tweeted about this but wanted to mention that it felt like the current continuity in the Batman comics—where Bruce and Selina just got engaged—was subconsciously influencing my choices for the Bruce and Selina romance. I remember being colder toward her in season one but am now being driven to see how a love affair between the Bat and the Cat plays out in the Telltale Bat-verse. • This sequence with John Doe’s Bat-signal puppet show is hilarious. Can he just not turn into the Joker? Please? • Let’s get a spin-off where this isn’t just playacting.